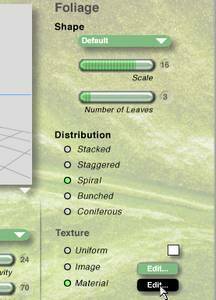 Download the tree(s) and the leaf texture file and unzip them. Put the BTO files in the Bryce5>Presets>Trees folder. 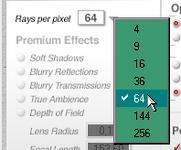 Due to a bug in the Bryce 5.0.1 .BTO export, incorrect textures get saved with the file. 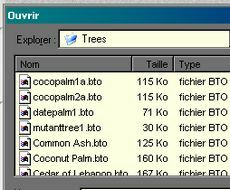 Select the Import button and navigate to the palmleaves.mat file and click OK. This should load 3 new leaf materials at the end of the current list. Make sure the tree is selected, and hit the little "E" next to the tree. 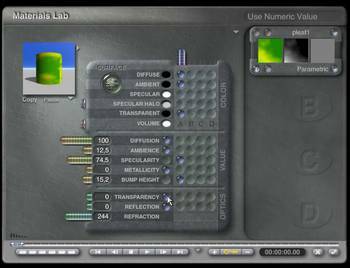 Under Foliage, select the Material Edit button and apply the appropriate leaf material. All the leaf materials use alpha transparency, which will greatly slow the render (but I think they look better). This can be removed by setting the Transparency amount to zero and moving the blue ball out of the first channel in the Materials Editor. 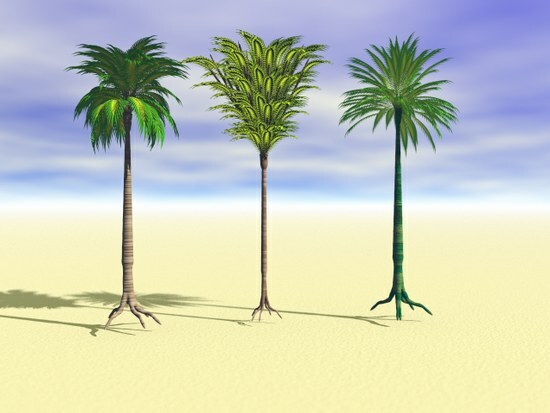 These Palm Trees always look better when rendered with the Super or Premium modes set for at least 16RPP (Rays per Pixel). Trees above rendered at 64RPP. The trees should be also be "sunk" fairly fair into the ground, to avoid the roots and the low bulge in some trunks.